Save the Children has today, 18 July, published a report based on a University of Bristol study which says that there is a ‘gender gap’ in the early years, with girls outperforming boys in communication and language, particularly boys from deprived backgrounds. We are firmly committed to helping every child, regardless of their background or gender, reach their potential – the latest figures show that more than 80% of children are now reaching the expected communication and language skills by age five. We are clear that an excellent education is vital for a child’s life chances and have already made a significant investment in the early years sector so we can continue to attract more high quality staff including more trained graduates. We are determined that every child, regardless of background or gender, reaches their potential. The latest figures show more young children than ever are achieving the expected level of development in the early years, with more than 80% of children reaching the expected communication and language skills by age five. Getting an excellent education is vital for a child’s life chances, and we are making a significant investment in the early years sector. We want to continue to attract quality staff into the early years, including more trained graduates – that’s why we are providing funding for course fees and bursaries for eligible trainees, and supporting employers to help with staff training. As a result, numbers of qualified staff have risen, the number of graduates in the workforce continues to rise, and a record number of providers are rated Good or Outstanding. 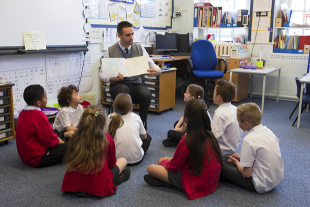 Find out how you can get into teaching.